A few weeks ago, a friend sent me a New York Times article on cheese balls titled “To Find Out Who You Are, Peer Into the Cheese Ball”. I was delighted. One sentence in particular resonated with me, “December is the Olympics for cheese ball fans.” Truer words have never been spoken. Oh how I love a cheese ball, a cheese log or those wonderful tubs of crock cheese anytime really but especially around the holidays. On a cracker, or better yet a Triscuit, there are few better snacks. While I certainly favor some flavors over others, I’ve yet to meet a cheese ball I don’t like. That pink “port wine” crock cheese? One of my favorites. A cheese ball makes a party, my friends. True story. Since I was heading to a holiday party where said friend and cheese ball lover would be in attendance, I pulled up the recipe and made one. I’d recently finished a project for a cheese company and there were several large blocks of cheese in my fridge, mainly swiss and various cheddars. This was the perfect opportunity to make a dent in that pile but there was a problem. I did not have all the ingredients on hand and given that it was 11pm, I wasn’t about to get them. But here’s the miraculous thing about a cheese ball; you use what you have. And I did have a lot of cheese. So I took the NYT recipe as a guide and used medium sharp cheddar, swiss and a little blue for the main cheeses but had no goat cheese so I increased the cream cheese accordingly. No scallions but I had shallots. I had lemon juice but forgot to use it. No parsley because I didn’t have it but I had a better idea instead. Nuts. Lots of them. I’ve always liked a cheese ball rolled in nuts – pecans, almonds or pistachios. The texture – that crunch and nuttiness – made for a great bite. So I decided to coat my cheese ball in almonds, sliced almonds in particular but no regular ball or log would do. I wanted a cheese ball pinecone. Like it was Christmas 1974. You bet. At the party, the unveiling was spectacular. 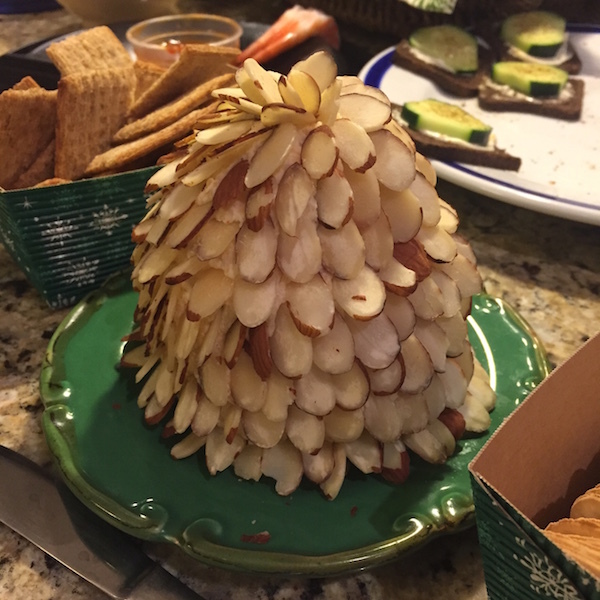 Who would have thought that a single pinecone shaped cheese ball, with each almond placed ever so, would delight us all so much? It was creamy and delicious, with just enough savoriness from the blue cheese and the shallots, a bit of heat from the cayenne and the fish sauce gave enough umami-ness to pull it all together. Most cheese ball recipes use Worcestershire but this recipe made me realize I much prefer fish sauce. Genius. And a bit of butter blended in was a brilliant idea that made the cheese ball extra smooth, creamy and lovely. Make it – you have just enough time to pull this together for your New Years celebrations or better yet, your New Years Day bowl game marathon. Don’t we all have a steady supply of snacky things on New Years Day? It’ll be perfect! STRESS THERAPY BAKING FACTOR: DELICIOUS NOSTALGIA. C’mon admit it. You love a cheese ball. Everyone does – I’ve made this three times in as many weeks and everyone loved it. While I’ll often go for store bought, a homemade one is surprisingly easy. But the absolute best thing about this recipe is it uses what you have. Do you have a lot of extra bits and bobs of cheese leftover from Christmas? Throw it in. Use it all up in one big creamy mix. Add in some of those flavorings – shallots or scallions, cayenne, fish sauce – until you like the flavor, roll it in some nuts (likely also leftover from your holiday baking projects) and you’ve got something delicious and wonderful. No one needs to know it was crafted from leftover bits because it’s so good just as it is. Do it. Ok so the original recipe called for 1 cup shredded cheese but that wasn’t enough for my preferences so I upped it to 1 ½ cups, mostly cheddar. The final ½ cup is a bit odd as I like enough blue cheese to give the cheese ball a little zip but not enough for the flavor to dominate. 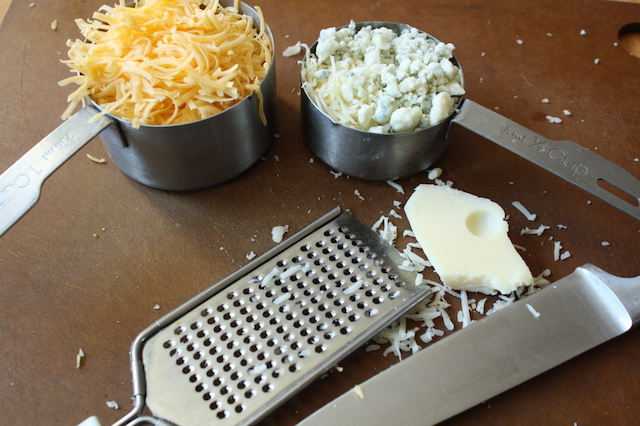 So I do it like this: I fill the ½ cup measure about ¾ full of finely grated swiss and top it off with blue cheese crumbles. The exact weights are noted below. To the bowl of a standing mixer fitted with the paddle attachment, add the cheeses, cream cheese, butter, pepper, salt, shallots, cayenne and fish sauce. Note: if you don’t have a standing mixer, a hand mixer or a wooden spoon and some good arm strength will work too. If you go the spoon route, make sure the cream cheese and butter are really soft. Beat until smooth, scraping down the sides of the bowl once or twice. Scrape the mixture onto a piece of plastic wrap and gently form into a ball. Refrigerate for at least 15 minutes or until firm enough to work with. I found it best to chill overnight. Once chilled, form the mixture into a pinecone shape and place on a serving plate. Starting from the bottom, place a ring of sliced almonds, overlapping slightly. Move up one layer and continue in this fashion until the pinecone is fully covered. Or if you like, form the mixture into a ball and roll in the sliced almonds. Or use any nut (pecans, pistachios, walnuts) and any shape you like (pinecone, ball, log). Wrap well in plastic wrap and refrigerate. When ready to serve, let the ball sit out for at least a half hour to soften. Serve with crackers; Triscuits are traditional in my book.